Let's get one thing straight - if nature wanted you to eat organic vegetables, nuts and seeds in silence, it wouldn't have made them so crunchy! 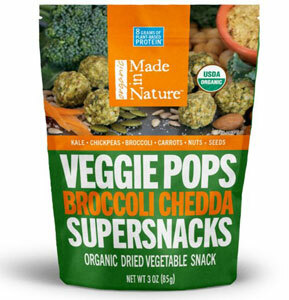 So, Made in Nature has given us all a deliciously healthy way to snack while being far from quiet, with amazing flavor that's so bold, it'll knock you on your backside! These Veggie Pops are made with organic whole food ingredients and nothing remotely unnatural or artificial, with 7g of plant-based protien and 4g of healthy fiber in every serving. With awesome vegan sour cream flavor and good-for-you foods like kale, chickpeas, carrots, cauliflower and more, they're the perfect snack for kids and adults alike! 3 oz. (85g) package is $4.99. From Anonymous of Middlefield, Ohio on 12/20/2018 . Great medley of flavors of superfoods for satisfying snacking on the go.